You just have to love the Carlisles. I read the other books in this series and each of the characters is very different, but nevertheless detailed and interesting. Ross and Grace have secrets. Ross seems to be Graces chance to ensure her son's birthright, getting his inheritance back, and Grace on the other hand can help Ross to get back to London in order for him to clear his name. The characters are so likable, intelligent, protective and you can nearly 'feel' their emotion. The storyline is well developed. A joy to read about their journey. The danger they are in heightens the books attraction. Even if you haven't read any if the previous books, you can read that without doing so. A clear reading recommendation! Those Carlisles are a family, I can tell. Every book is better than the one before with unique stories and different characters. Enjoy this series. OMG !!!! What a fabulous book ... 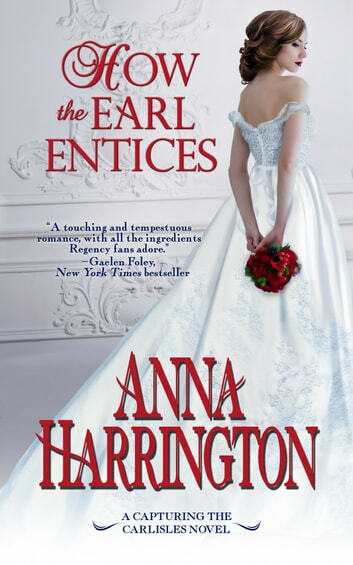 Though i have not read the previous books in the " Carlisles " series i was floored by " How The Earl Entices " book 4 in this series ...it can be read as a stand alone... I loved it ...Anna has done it again ....her presentation ,concept of a story is superb ...she handles a story uniquely... Right from the start it was gripping ...i just had to read it in one sitting ,,,not one moment of boredom... It starts with a man being tortured who happens to be the hero of this book ...Ross Carlisle, Earl of Spalding,is a spy & has dedicated his life to serving his country., he is forced into undue circumstances which wrongly accuses him of murder & Treason ...He is in the process of racing to London to prove his innocence & protect England from its enemies when he is attacked.... He escapes the clutches of the enemies wherein he meets the heroine Grace ... Grace Alden is a viscountess on the run so she can save her son Ethan from her wicked , cruel brother-in-law...hence since the last 10 yrs she has been in hiding ... Grace saves Ross & in exchange blackmails him to help her gain her son's Inheritance,title... Hence the two embark on a journey to London to right the wrongs done to them ... they both help each other through all the hardships , troubles coming there way & eventually fall in love ... There is adventure, action, spy angle, murder,escapes,masquerades, suspense , intrigue , passion, love, Romance, sizzling chemistry all of the elements to make a book successful...Anna has used all this ingredients very aptly in the story which made the story captivating .. .and the story is not predictable... Anna has given us so many interesting twists & turns that a reader becomes curious to know what happens next...always on edge it was so thrilling to read ... I fell in love with Ross...such a strong, handsome , bold hearted & adorable character... he is loyal, modest, brave & a patriot through & through ... Grace 's character also comes out strong , beautiful..loving after all the misfortunes she has faced ... There is humour , witty dialogues ...Even the secondary characters were so in synch with the story .. I liked Christopher's character a lot ...would love to read his story definitely ....also the characters in the previous books of this series also appeared in this book ...awaiting to read there stories now... Well done Anna & Thanks for this book...You made my day ....Its refreshing when u read good writing ....You have a simple & marvelous Penmanship ... "I received a ARC copy of this book from the the author Anna Harrington ...this is my voluntary & honest Review "
What a fantastic story! Ross and Grace are so fun together. So charming and witty. I couldnt put it down I laughed and cried, even bitting my nails waiting for the next thing to happen. I have been following Anna since her first book. I think this is her best one yet. Ross and Grace unforgettable! All I can say is Amazing! It is reading stories like this one that make me realize all over again why I love historical romances!! 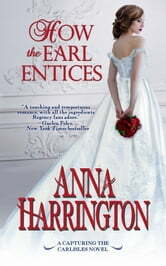 Anna Harrington has a gift for wonderful prose that always pulls you into the story with her descriptions and amazing characters. Intrigue, secrets, adventure and strong emotions will make you turn the pages to find out what will happen next! Ross Carlisle, Earl of Spalding and dedicated servant to England is in a bad situation. Captured and beaten so that he will give up secrets,, he is taken on a ship from France to England He gets his chance and jumps over the side. Of all places for him to come ashore, he ends up at Grace's cottage, where she has been hiding with her nine year old son and she recognizes him from the past. He is desperate to hide and get back to England and clear himself of the charge of treason. I truly loved Ross and Grace. They both had secrets and each agreed to help each other on their different quests which really brought them together. The attraction between the two came off the page and the humor and witty dialogue was enchanting. But you will need to read to find out if the two make it to England and find happiness with each other. Part of a series, this can be read as a stand alone. But trust me, you will want to read them all!! Grace is living in a very small seaside town with her young son. One night there is a terrible storm and she has taken her son to a neighbor's house so he would be safe. While she is trying to sleep, there is a noise. Not from the storm, but a knock. When the door opens an injured man breaks into her house with a gun and tells her he needs to rest a night and then he will leave. Grace sees his face and he looks familiar. The name he gives her is not the name she knows him by. Grace is also not who she seems. Ross Carlisle, Earl of Spalding has escaped from France with some documents that brands him a traitor to the Crown, unless he can get certain documents to the right people. Grace makes a deal with Ross that she will help him if he will help her get her son's inheritance . She will not tell Ross who she is. As far as everyone is concerned, she is dead and will be if her brother in law finds out she is still alive. When Ross is arrested, can Grace get the documents to set him free of will be hang ? Great book, full of mystery and intrigue. I loved and cared about Ross and Grace. They were wonderful characters. I received this book from Net Galley and the publisher for a honest review and no compensation otherwise.